Found on Walking Street next door to Lollipop Gekkos Bar is right in main entertainment district. 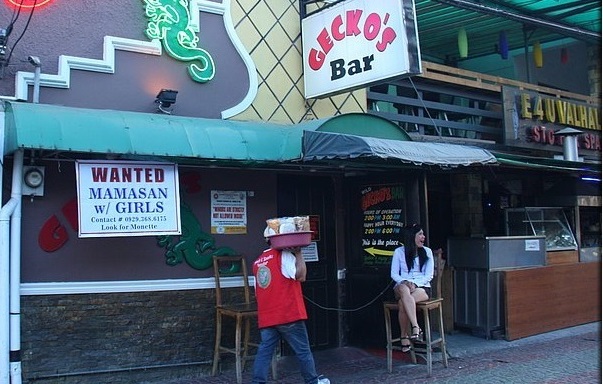 Although the bar is quite small it does quite well to hold up against the bigger bars on Walking Street with a fun and comfortable atmosphere Gekkos should definitely be on your list to visit. 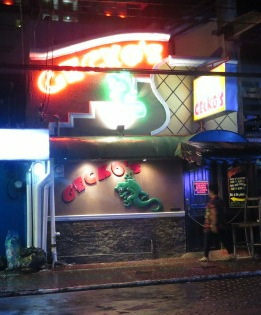 The exterior of Geckos is very stylish with a large embossed image of a gecko helping you identify the bar. Upon stepping inside the gecko theme continues with little green gecko stickers completely covering the inside ceiling. The stage runs up along the left wall while the right side wall contains comfortable couch style seating. Bar stools line the stage for those who want to sit up close and personal with the girls. The bar girls in Geckos are lot's of fun and give off a good energetic vibe. If you run out of cash do not worry as this bar allows credit card payments to settle your bill.